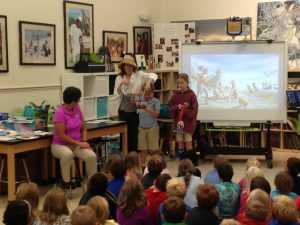 Students at The Island School relived local and Florida history once again on Wednesday, Nov. 15 when a Calusa shaman, Ponce de Leon, a pirate and an early member of the Padilla fishing family visited. The Johann Fust Community Library and the Boca Grande Historical Society once again teamed with the school’s staff to demonstrate that history is both interesting and exciting. In December the organizations will continue the saga with Fisherfolk and Cow Chasers, the story of the early settlers in our area. This month’s program presenters were Toni Vanover, branch manager/senior librarian at the Library, and Betsy Joiner, Nancy Lyons and Karen Grace from the Historical Society, with substantial support from Gladys Varga and Mary Vickers from the Library. The presenters especially enjoyed the enthusiastic and intelligent questions from the students.